The general story behind the book’s creation says that Rowling was a welfare mom when she wrote the book, though there have been conflicting reports about precisely how destitute she was. Because it makes for a better story people want to say that she was living on breadcrumbs with her daughter, scribbling the book out on napkins in coffee shops. Hardly. But it is certain that she was a single mom who wasn’t exactly flush with cash when she typed the book out the first time. Harry himself came to her while she was riding a train in 1990. Later she got an agent and, according to Anita Silvey’s 100 Best Books for Children, “Although nine English houses rejected Harry Potter, the agent sent it to a small British publisher, Bloomsbury, and Barry Cunningham took on the project.” Arthur A. Levine purchased the American rights to the book in April of 1997 because he is canny as they come. He also paid a whopping $100,000 in auction on a first-time author. Risky, but worth it. The advantage of conducting a poll of this sort is that I don’t have to participate in it myself. A confession? I never made a top ten list of my own favorite top ten children’s books. If I did, I’d have a hard time deciding which Harry Potter to place there. There is no doubt that one of them would make an appearance, but which? #3 is my favorite. #2 turned me into a librarian. But as mom points out, if the first hadn’t been a success we would never have gotten to see any of the others. Odds are I’d include it. I own an edition of the first book in its original British paperback state. It’s a 25th printing of the paperback so I don’t keep it out of anything but affection. Still, I remember always being puzzled by the wizard pictured on the back. What I love about this is that they kept the yellow striped pants for the final Dumbledore. I don’t know why, but they did, and it’s a tiny detail I’ve always appreciated. To a large degree Harry Potter began the notion of online children’s literary fandom. At least in the literary sphere. The Leaky Cauldron was the site that was clever enough to jump on board with that idea and they’ve been doing mighty well ever since. 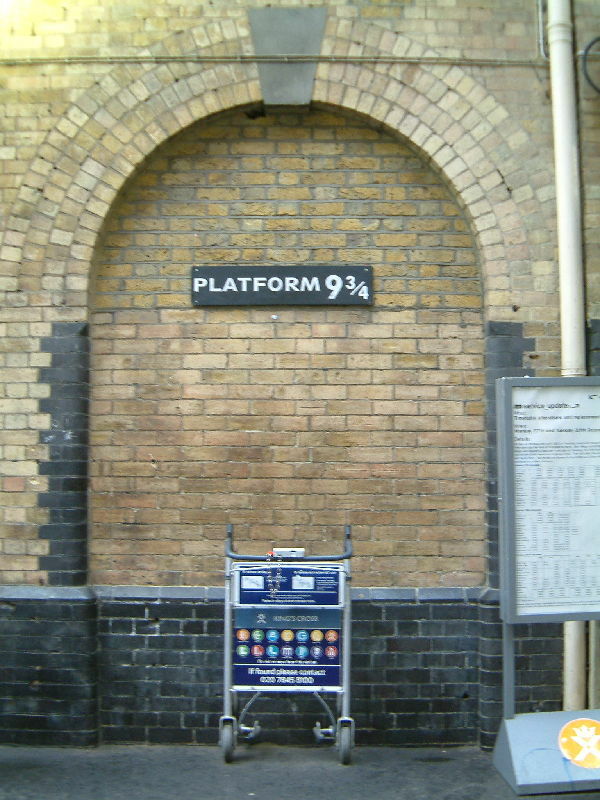 I rather love that at the real King’s Cross Station there’s a faux Platform 9 3/4 and that there’s a luggage trolley poised halfway through, as if entering on its own. Or maybe someone’s pulling it in from the other side. You’ll see a lot of new countries showing up when I show you these international HP covers. That’s partly because in a lot of cases a country will create their own version of #1, then reproduce the British or American jackets for the sequels. One cannot help but watch this trailer and wonder . . after they make the last two films of the final Harry Potter book, how long until they remake this movie? I’m giving it ten years. Tops. But surely the remake should be a mini (maxi) series, right? And now I’m scared to death. Two slots left, and I assume one is Charlotte’s Web. So, maybe I missed a day? Because there’s no was that The Secret Garden, The Wind in the Willows and Alice in Wonderland could have been left off, right? Right? The wizard on that first cover might well have been Chrestomanci. Of course, the great magic-maker realized he was in the wrong series and decamped. The Secret Garden is in for sure. I’m pretty confident that ALICE is also in. But I’m not sure about THE WIND IN THE WILLOWS. Unfortunately, going back to check is extremely difficult and time-consuming. Alice and Secret Garden have already had their day in the list. Tomorrow will be A WRINKLE IN TIME. Leaving Mr. Toad bottoms up in a ditch along side the road. The wizard on the back of the first edition HPPS is actually a printing error. It is Dumbledore (as he is seen in the Pensieve in the later books). He was not meant to be printed like this, and there are a limited number of books with him printed like this on them. It is worth a lot of money.